Updated for 2016 with new style and tech, the segment's only European entry boasts excellent driving manners and exceptional roominess. Rear-seat legroom is class leading, the driving experience is both relaxing and satisfying, and with the tech upgrade VW's Passat becomes one of the first vehicles to offer Apple CarPlay and Android Auto integration. With confident styling that stands the test of time, excellent European driving manners, a huge back seat and a whole bunch of newly available safety and convenience technologies, the 2016 Volkswagen Passat blends a variety of appeal into one affordably priced midsize sedan. Compared to perennial standouts like the Accord and Camry, resale value and long-term reliability aren't traditional Passat strong suits. If minimizing overall transportation costs is among your key considerations, your new midsize sedan is probably waiting for you at another dealership. The Volkswagen Passat has been nipped and tucked for 2016, a makeover that includes revised front, rear and interior styling, plus a long list of new technology features. The diesel-powered Passat TDI is on hiatus until further notice, but the lineup gains a sportier-looking new Passat R-Line variant. There's nothing subtle about the cavernous interior dimensions. If you regularly shuttle NBA players or regular-size adults, the 2016 Volkswagen Passat and its uncommonly roomy rear seat are must-sees. Included in the model's 2016 update are a redesigned gauge cluster, enhanced details, improved materials and an overdue tech upgrade. Touch-screen control plus Bluetooth and USB connectivity are standard across the line now, and the available Car-Net system that provides Apple CarPlay and Android Auto integration also enables a variety of advanced services. For example, your computer can be alerted if your teen driver has exceeded a set speed or boundary. The changes are subtle at first glance, but the 2016 Volkswagen Passat has been redesigned from the windshield forward to give the sedan a more commanding presence, with a newly sculpted hood, slimmer headlights and bolder grille adding both refinement and strength. The new Passat R-Line variant takes the sportiness a step further, with unique front and rear styling touches, darker 19-inch wheels and more. The Passat's tech upgrade includes the ability to open the trunk when your hands are full by waving your foot under the rear bumper (when the key is in your pocket or purse). Why didn't the Passat's 2016 model year update include any significant powertrain or suspension changes? Because it was already among the best-driving midsize sedans on the road. Delivering a sophisticated highway ride that keeps drivers connected and everyone comfortable, the Passat also shows off a playful, athletic side when the opportunities present themselves. Our chief quibble is that the turbocharged engine isn't particularly smooth to engage in the stop-and-go of city driving, the upside being that it's among the most satisfying and most efficient engines in the segment. The Passat also offers a 280-horsepower V6, but the added power isn't worth the added cost and reduced efficiency for most buyers (and the dual-clutch automatic transmission paired with the V6 also hinders off-the-line smoothness). The 2016 Volkswagen Passat has a Manufacturer's Suggested Retail Price (MSRP) starting around $23,000 with delivery fees and tops out at more than $37,000 when fully loaded. From a features-per-dollar perspective, buyers can expect the Passat to cost more than class leaders like the Honda Accord and Toyota Camry. The Passat's reliability record isn't as strong as many others' in the class, and that contributes to lower resale values and higher long-term ownership costs. Looking at it another way - the same way many satisfied Passat owners look at it - the Passat is one of the most affordable European sedans money can buy. Just make sure to check the Passat's current Fair Purchase Price on KBB.com before heading off to make your deal. At its starting sticker price of just over $23,000 with destination charges, the 2016 Volkswagen Passat 1.8T S has a 170-horsepower turbocharged 4-cylinder engine, 6-speed automatic transmission with manual-shift mode, dual-zone climate control, auto headlights, infotainment system with 5-inch display, Bluetooth and USB connectivity, rearview camera, 60/40-split-folding rear seat, cloth seats and Automatic Post-Collision Braking System. Not a bad list. In addition to a moonroof, leather seats, premium audio and other traditional upgrades, the new Passat offers a long list of modern amenities as you climb the price ladder. Radar-based smart cruise control and semi-automatic parallel parking are great conveniences, while Forward Collision Warning, Lane Assist, and Rear Traffic Alert with Braking are terrific modern safety features. Apple CarPlay and Android Auto enter the picture with VW Car-Net at around $27,000, while keyless entry and push-button start aren't available for less than about $29,000. Apple CarPlay and Android Auto are going to revolutionize in-car infotainment, and the Volkswagen Passat is among the first midsize sedans to offer both. Choose a song, dictate a text message or navigate to a destination with the ease and familiarity of your smartphone. Radar-based "smart" cruise control is becoming more common on mainstream vehicles, but it's still a surprise-and-delight feature in anything this side of the luxury set. Set your speed and the Passat will automatically slow down when it approaches slower traffic, and speed up again when the road is clear. With Volkswagen's popular diesel engines on administrative leave for EPA violations, the 2016 Volkswagen Passat lineup includes two engines. Most buyers will choose the 1.8-liter turbocharged 4-cylinder engine matched with a 6-speed automatic transmission. With underbody aerodynamic improvements and a couple mechanical tweaks, this combination is now rated to deliver an impressive 38 mpg on the highway, up from 36 mpg last year. Models equipped with the powerful 3.6-liter V6 engine option also feature a quick-shifting dual-clutch automatic transmission with steering-wheel-mounted paddle shifters, both of which combine to deliver even more European feel. All Passats are front-wheel drive. As the midsize- sedan segment's only European entry, the 2016 Volkswagen Passat is among the most enjoyable drivers in the class. Even when not on the Autobahn, the Passat's confidence-inspiring driving dynamics make for a satisfying and relaxing driving experience. But this Passat was designed specifically for North American tastes and preferences - it's even built in Chattanooga, Tennessee - so it's also roomy, practical and priced to compete with midsize-sedan staples like the Toyota Camry and Honda Accord. For 2016 the Passat receives a much-needed makeover to help it compete even better, and is among the first vehicles to offer Apple CarPlay and Android Auto integration. 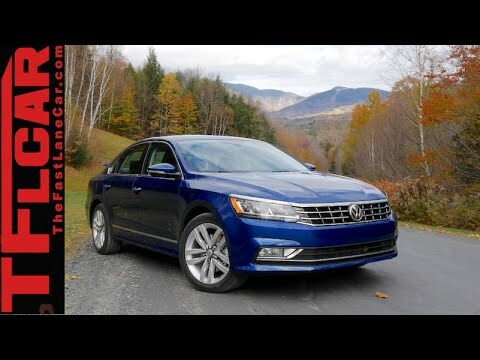 2016 VW Passat First Drive Review: Will German VW Engineering Still Sell Cars? 2016/17 Volkswagen Passat 1.8T SE Review - Worthy of Your $$$ ? My Passat is the queen of cars! My VW Passat is very quiet when I am driving. We went to Las Vegas and back from San Diego on one tank of gas. It is a medium size car and very easy to parallel park. It has room for grand kids in the back seat and has plenty of legroom in the passenger front seat. The windows automatically roll up and down with a push of a button. The steering wheel can be adjusted for the needs of the driver. We nicknamed our car Queenie. The grand kids like the name and love to go on trips with Queenie. Giving her a name personalise your car as one of the family. The grand kids don't want to ride in any other car because they do not have names. Queenie has soft interior cushy seats for long rides. Grand kids can nap while on long trips. The gas mileage is insane and the best mileage for any vehicle I have owned. Am in my 70s and have owned 10 cars in my life. Three of them have been Volkswagen vehicles. Several young adults have learned to drive with Queenie being the instructor. Now they all want a Volkswagen for their first vehicle. Queenie loves parking garages because she gets to park with other cars. Being social she makes friends with other cars and especially likes big trucks. The grandchildren who are now teenagers get to compare Queenie with all other vehicles by size, style, available colors, interior decor, driving ability regarding turning radius, wheel treatments, dashboard design, interior lighting, and ease of using the steering wheel. We have 16 grandchildren who may all become Volkswagen owners just because of their relationship with grandma's car, Queenie. 2016 Volkswagen Passat. Great family car, very spacious and great gas mileage. The performance on my 2016 Volkswagen Passat is out of this world compared to my previous cars. It drives like a dream. My particular model is turbo charged and you can be driving at 90 mph and it handles so well you do not even notice it until looking at the speedometer. The car handles the road incredible and in all driving conditions other than snow and that is only because of the location in which I live. The Passat has incredible gas mileage both city and highway. The cabin is very spacious and features a touch screen radio that is Bluetooth capable as well as USB and SD card slots. You can also use your phone through your stereo system. The sound system is wonderful and for someone like me who loves music, you would love this stereo system!! The trunk is super spacious as well and my favorite part is the trunk has a hidden button you can press to open it that way you're not shuffling all your stuff to try and hit the button on the remote. You will not be disappointed if you purchase this vehicle. I am 1000% happy with my buy. I hope you will be as well!! The gas mileage is great. I don't know the exact amount of mpg it gets, but with my 2010 Jetta I was refueling about once a week or so, whereas now I'm only refueling about once every 2 weeks of so. I love the technology options, from heated seats and controls on the steering wheel for radio and more, to Bluetooth and automatic controls for my seat. The moonroof is a great bonus, as are the center console bucket and rear middle seat pull down for an armrest and cup holders. The entire interior of the car and trunk are very spacious, and the leather seats are quite comfortable. The valet key to lock the glove box is great for keeping items safe when I have to leave them in the car, and the digital reminders are very helpful, especially when low on gas and it estimates how many more miles can be driven. The gas mileage is amazing, so I only have to refill about once every two weeks. Also, I love that there are digital numbers listed for the air temp and speed, so it's much easier to tell what each it. Lastly, the number of ports for phone chargers is extremely helpful.